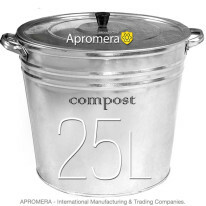 Apromera-manufactured Metal Compost Bucket is a fresh look at customary things. 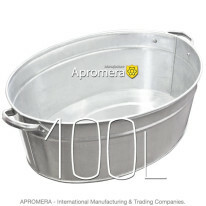 When repairing your flat, house or garden, each of us has inevitably faced a l problem of disposing garbage. 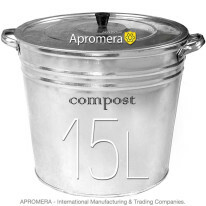 The Galvanised Compost Bucket of 15, 25, 32 Liters capacity allows you from now on to treat organic waste differently. 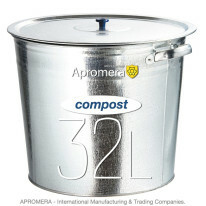 This means it does not go to the waste deposit but back to nature as humus. Still keeping your trash bin in an inconspicuous corner not to attract attention? 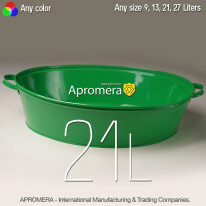 You will have no wish to hide Apromera`s new collection models because they will definitely make the original home and garden decoration. 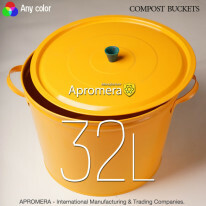 The Coloured Compost Bucket with a lid is an easy-to-open model which is sure to wear well. 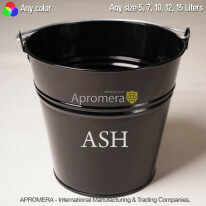 This bright container is made from 0.5mm-thick high quality galvanised steel, making it easy and simple to clean. All models are made under quality control so they are absolutely safe for your family. 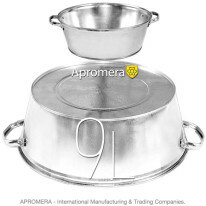 Make your choice and order the best products from Apromera at a reasonable price today and enjoy the quality of our goods.